Albert van der Heijden has been interested in motorcycles from an early age. He was a participant in trail competitions in the Dutch championship in the seventies. His interest was obviously British motorcycles. During that time Norton was famous for his strength. That’s why this brand of “unapproachable” was his favourite. 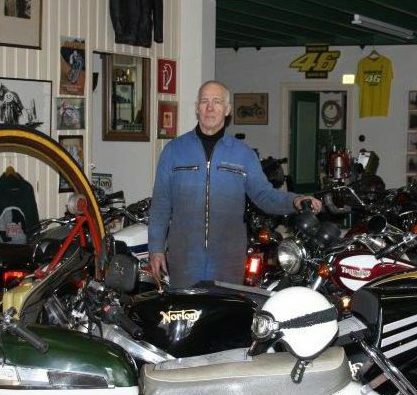 His hobby was to collect and restore everything that had to do with Norton motorcycles. His collection grew and then the idea came of ​​setting up a Norton Museum. Albert was given the opportunity to take over his parental home and the neighbouring house of his uncle. After a renovation of 7 years, both homes have been restored to it’s original condition, exactly as it was built by his grandparents a 125 years ago. The collection includes about 40 Norton motorcycles; single, twin and rotary’s. The oldest model dates back to 1925; Norton 16H flattanker, completely with carbide lamp and blow horn. A famous member of the group is the Manx 350 with which Bob Brown (Geoff Duke’s brother in law) won the Dutch TT of Assen in 1959. Also is shown an original works racer of 1974 (the space frame), raced by Peter Williams and Dave Croxford, in the museum and a 1988 Rotary Classic Serial No. 025 of a Limited Edition plus a brand new Norton Commando MK2 of 1974 with only 11 km. on the tachometer. These are only a few bikes of the complete collection in the Norton museum. Also 5 other motorcycles brands are exhibit to give a view into the British motor cycles industry. There is a wide range of accessories and original documentation and also is shown 20 classic bicycles from 1869 to 1945.